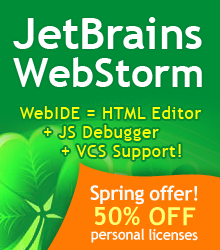 Where to redeem the advertised discount of 50% off from JetBrains WebStorm? The other day when I was looking at a JetBrains WebStorm personal license, the price was $69. Today, I saw an Ad on SO from JetBrains offering 50% off a WebStorm personal license. When I clicked on the SO ad, I was taken to the JetBrains' WebStorm page; and upon attempting to purchase the WebStorm personal license, the price was still $69. Where is the 50% off? I'm WebStorm Marketing Manager at JetBrains. Thank you for noticing this mistake and reporting it. We fixed it. And by the way we can award you with free WebStorm Personal License if you want to :) Just drop a note: alexey.korsun at jetbrains.com Thank you, once more. I handle advertising sales for Stack Exchange. I have reached out to my contact at Jetbrains to look into this further. Please allow me some time to get answers and I'll post them here. Are ads on Stack Overflow connected to user activity and interests? Ads linking to the wrong page? Why do some SO adverts seem to pass rep as an url parameter?